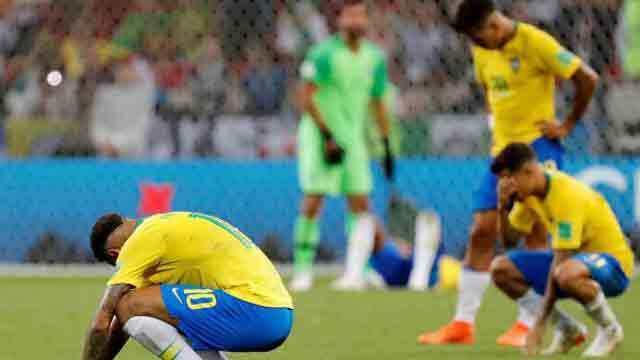 Kazan, July 6 (Just News): Four years after the psychodrama of Neymar’s injury and a humiliating World Cup semi-final defeat as hosts, Brazil are forced to come to terms with the crushing disappointment of a failed mission in Russia. That even applies back home—“Sublime genius or pathetic farce?” read one headline, in weekly magazine Epoca. In four years it may be a very different Brazil—after all, Neymar was one of only six survivors in the squad from 2014. Soon enough they may turn their thoughts to next year’s Copa America on home soil, but nothing compares to a World Cup for the Brazilians, and another one has just slipped away.